First comes marriage and then comes children. That was what my husband and I planned back in 1994. Our son Kyle was born 9 months after our wedding. It was an easy pregnancy and uneventful birth. We were delighted as he met all milestones over the next few months. When he was 9 months old, we noticed Kyle’s head would subtly nod his head “yes” 3 or 4 times. A visit to our paediatrician and an EEG left us shocked at the neurologist’s findings of epileptic seizures. In order to confirm the presence of seizures, more tests were scheduled. These tests were also conducted to determine if any malformations or lesions were present on or in his brain causing the seizures. Test results fortunately showed no malformations or lesions. Kyle was given anti-seizure medication and admitted for observations and further testing. We were not prepared for a hospital stay. I remember the heavy metal hospital crib. The sides, in the up position, seemed very high. I particularly hated the clicking sound the bars made separating me from my child at a time when I needed to be closer to him, and him closer to me. Kyle’s final diagnosis was what are commonly referred to as “head drop” seizures. We were sent home with medication, follow up paediatrician appointments, and hope. But normal baby progress slowly diminished – he was no longer crawling, no baby talk, and his interaction faded. Medication side effects made him hyperactive or zombie-like. His seizures increased in frequency and what followed was a lengthy trial of various combinations of medications. There was no improvement and that scared us beyond words. Daily seizures were so frequent that we stopped counting. It was just too demoralizing. Would he ever walk? He got heavier, making it difficult to carry him. Our family’s loving support was there from the beginning and in different ways. Family members pooled their money to buy a unique three-wheel stroller. It was easy to set-up and go from one appointment to another, the stroller was Kyle’s front seat in this battle. Kyle was delayed in many aspects of his development and required physical, occupational and speech therapy almost daily. There were many heart-breaking moments where we feared for Kyle and his future but we never gave up. We never stopped fighting. We never lost hope. A family member saw a Dateline story about a diet helping people with epilepsy. Hollywood producer Jim Abrahams’ son Charlie was diagnosed with epilepsy. Their child’s seizures were not controlled by medication. Jim did research and discovered Johns Hopkins Hospital treated kids with epilepsy using the Ketogenic diet. On the diet, Charlie’s seizures were completely controlled. We immediately contacted the Montreal Children’s Hospital, and learned that the diet was being administered there! Our neurologist, however, did not have confidence in the diet. It became clear that Kyle’s medication was not helping. We insisted that Kyle be placed on the diet as we had run out of options. Undeterred by our neurologist’s lack of confidence, we assembled our team: a neurology nurse, a dietician and ourselves would administer the diet. We were admitted to the hospital and started the required two-day fast. Imagine not feeding your eleven and half month old for two days! Gradually we introduced Kyle to the diet. Our dietician (our hero!) Instructed me how to calculate his meals according to the figures (fat/(pro+carb) ratio). We continued the diet and recorded everything, from ketones, seizures, weight, mood, bowel movements, medication, etc. Remember: this was all done pre-Internet. All calculations were completed by hand – there were no ‘Keto Diet Calculator’ and no ‘on-line support’. It was tough to find the correct ratio that kept him in ketosis. Calculations for his ratio, weighing his food and pureeing it, took many hours a day. Our dietician was 100% dedicated to working with us. We hadn’t seen any seizure improvement while he was on meds. The diet was tedious and time consuming but what was the alternative? On Kyle’s first birthday, he was on the diet for 12 days. I was very creative making his Keto birthday cake! After three weeks on the diet, his seizures diminish! 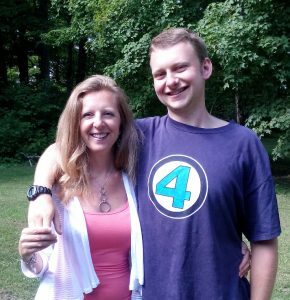 Within six weeks he was seizure free! Excited, we hoped for total seizure control. The diet requires follow up blood work, neurological assessment, and dietician reviews. Kyle’s awareness, mobility and communication started to improve. After a year on the diet, we worked with our healthcare team to wean him off all seizure medication. Still no seizures! We were over the moon with the results! On the diet for eighteen months, Kyle developed acidosis. We were referred to renal specialist who subscribed sodium bicarbonate. Still the acidosis was an issue. Kyle’s height was affected. He gained precious little weight. His hair and nails hardly grew. These were signs his body was ready to come off the diet. We slowly weaned him, watching carefully for any signs of seizures. He adapted slowly to a regular diet over the next few months and his acidosis corrected itself. We continued with speech, physical, and occupational therapy. His appetite grew as much as his height and weight did! Our hospital appointments became less frequent. Since then, we have faced other challenges. In grade 2, Kyle’s teachers noticed he was easily distracted and unable to focus and Dexedrine was prescribed. In grade 5 Kyle was assessed by psychologists and diagnosed with a learning disability. An IEP was setup and he began to enjoy school more, at least that’s what I believe. Fast forward to 2016 and Kyle remains seizure free. At 21 he drives the family car and attends some college courses. He weighs 175 lbs, is 6’ tall and has a hefty appetite. Life is good!